If you like making coffee at home then at some point you’ll get thinking about a Moka Pot. Espresso-esque coffee that can be made on your stovetop is pretty awesome. Also, it looks super cool, too. 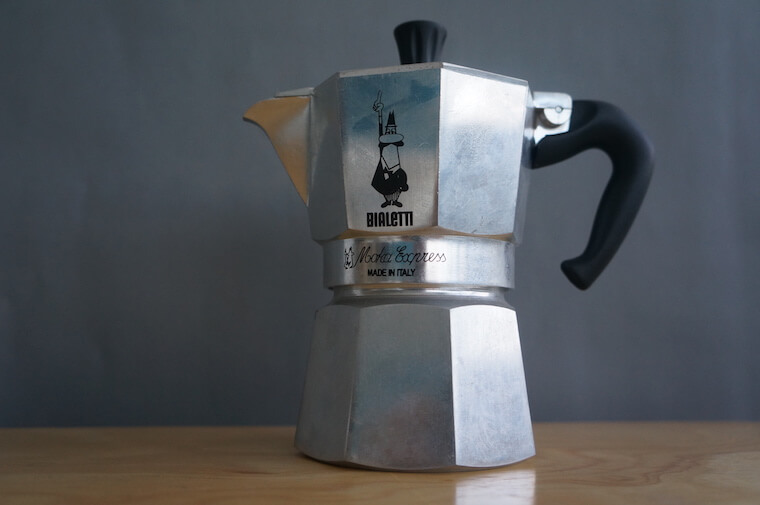 This is a review of the Bialetti which is the original Moka Pot and the one that is found in kitchens across Italy and other countries in Southern Europe. While this thing does not make ‘real’ espresso – you need a few hundred $$$ for that – for the cost it produces something that’s pretty darn close. 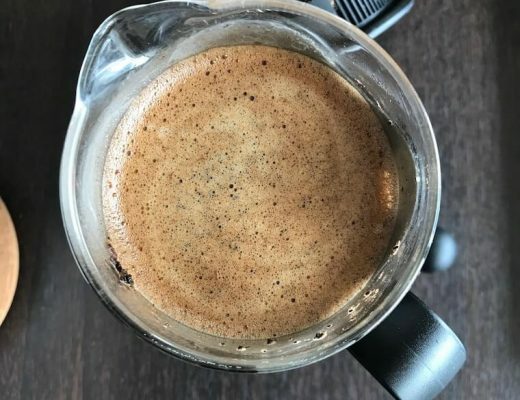 The taste can be pretty awesome when you make it well and you can still use the ‘espresso’ to make your favorite drinks like the Cappuccino or Latte. As a simple Moka Pot, the Bialetti is as good as it gets. Check it out on Amazon here or scroll further for my take in a bit more detail. Along with a whole bunch of my attempts at photography. First up, here’s a shot of the Bialetti with all its parts put together, ready for a brew. Along with the box that it came in. 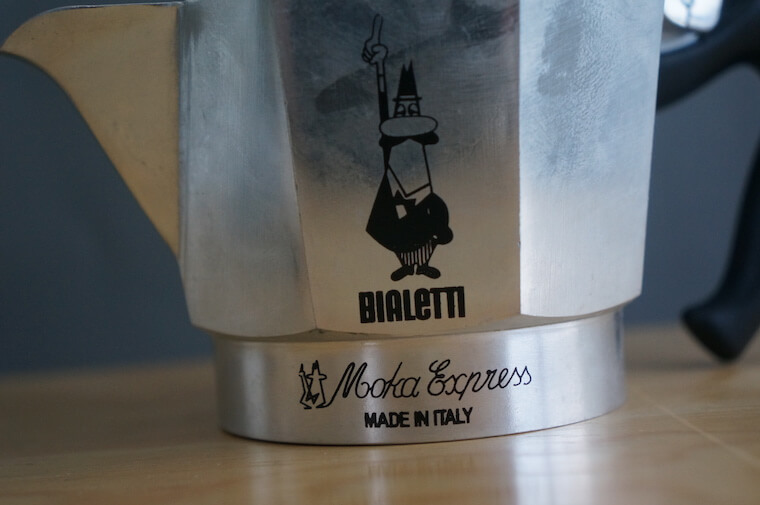 You’ll notice that it says ‘Moka Pot Express’ which is the type of Moka Pot this Bialetti is. 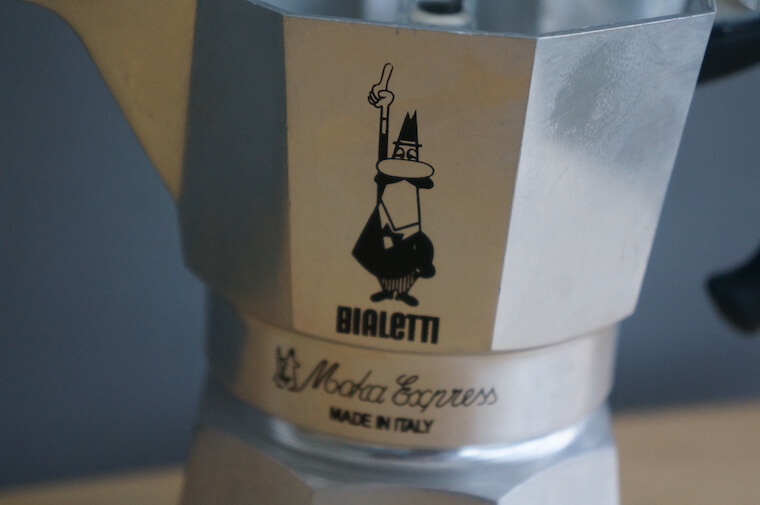 There is also the ‘Moka Pot Brikka’ made by Bialetti. I think the Express is the way to go, it’s the original and the best, pretty much. 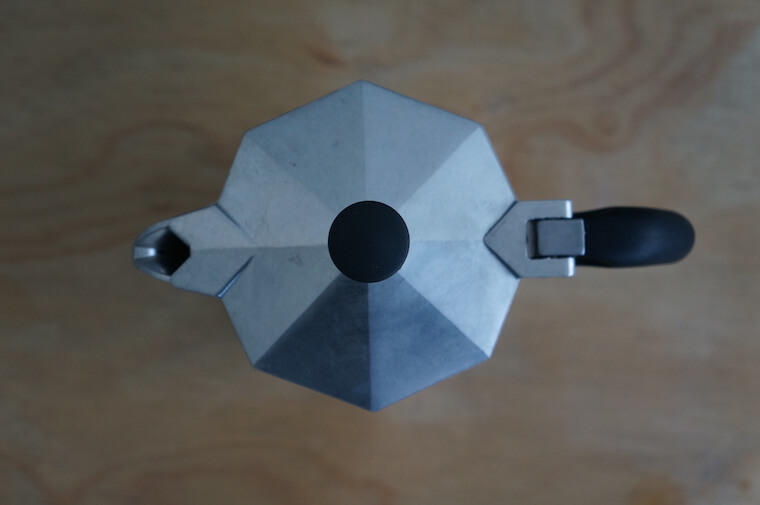 Here’s another look at the Moka Pot itself. It is made out of aluminum and is a shiny silver color. There are actually a range of colors available if you fancy something more decorative, click on that Amazon link to see what colors they do. 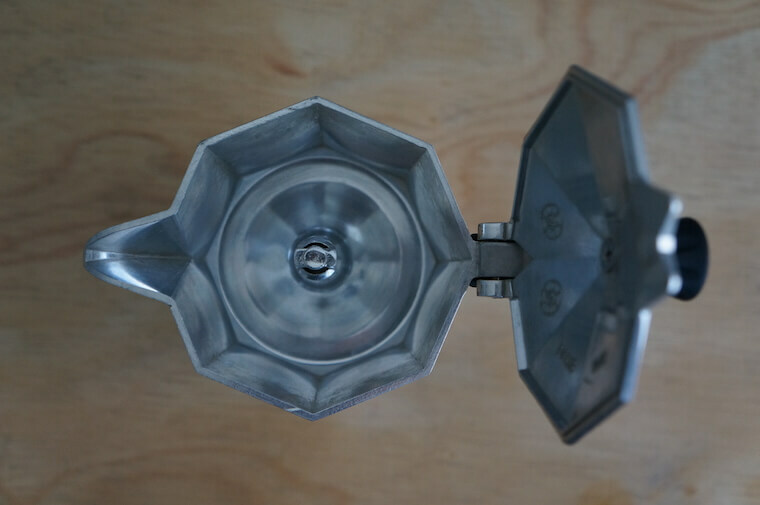 Here’s a closer look at the Bialetti. You can see the logo which is a man in a suit with a mustache. That’s actually a cartoon doodle of Alfonso Bialetti, the guy who created the company that made these products way back in the day. You also get a reassuring “Made In Italy” which is always nice in these days of poor quality outsourcing in countries that have lower standards than the West. 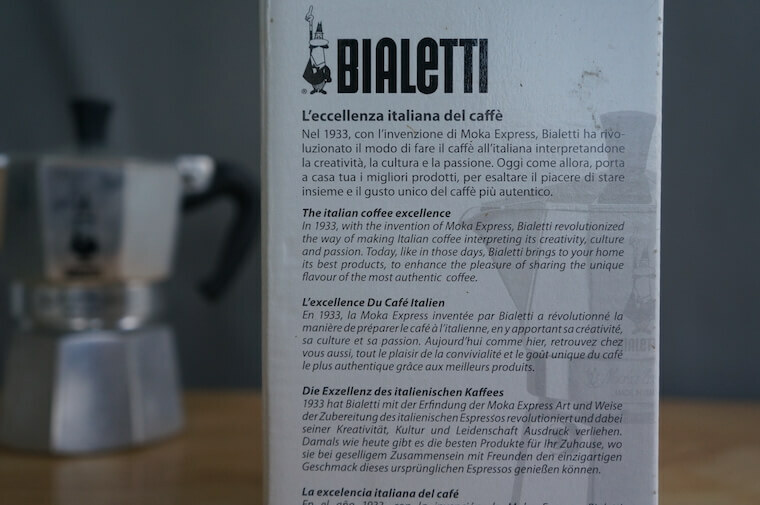 Bialetti are very proud of their contribution to the world of coffee, here on the box you can see a little snapshot of the history of this device. So the Bialetti is actually made up of three different parts or “chambers” which you put together to make the coffee maker in its usual form. You’ll need to take it apart each time after you’ve finished a brew to dispose of the grounds and give it a clean. This is a closeup shot of the bottom chamber where you will put your water. You put the Moka Pot on the stove where it will boil this water and send it upwards. Next is the middle chamber, this one you fill with your ground coffee, the water rises up through this chamber and the extraction takes place. Finally, we have the top part of the Bialetti where the coffee will end up. As your brew happens you can see the coffee spurt out slowly from the little fountain-type thing in the middle. Note: you can watch the coffee come out of the fountain by leaving the lid up, the issue is that sometimes it will spurt too fast and end up over your kitchen counter. More on how to avoid this issue a little later. Just to show you how it all locks together, this next photo has the middle chamber placed neatly into the bottom chamber. 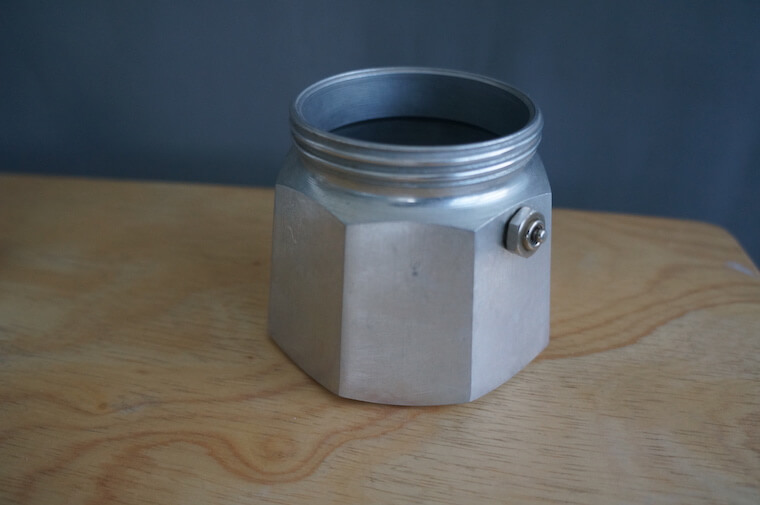 The top chamber will make the full form of the Moka Pot by placing it on top and screwing it on. Now the Bialetti that I own is the 3-cup model which is pretty much the standard for one person. I will say that it gives about enough coffee for a medium sized drink, which for many people is not enough. You can upgrade to larger models if you think you’ll want a larger drink on a regular basis. 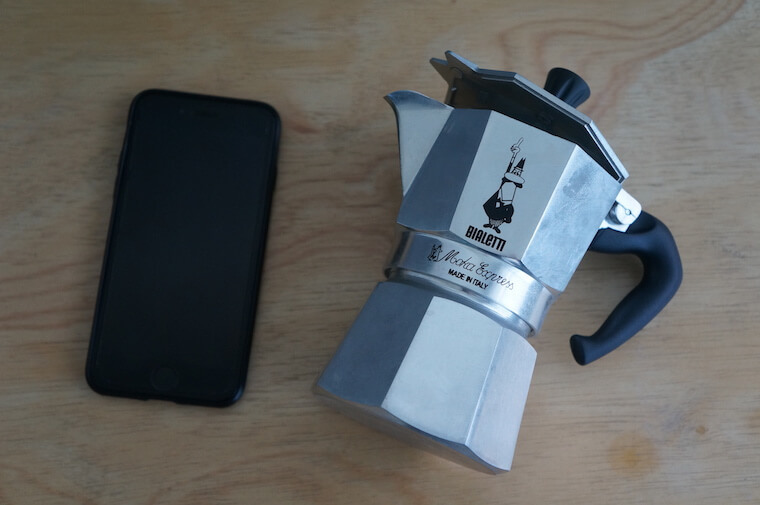 Here’s a shot of the size of the Moka Pot with an iphone 7 for comparison. It’s a pretty compact coffee maker really, very easy to take in your hand. 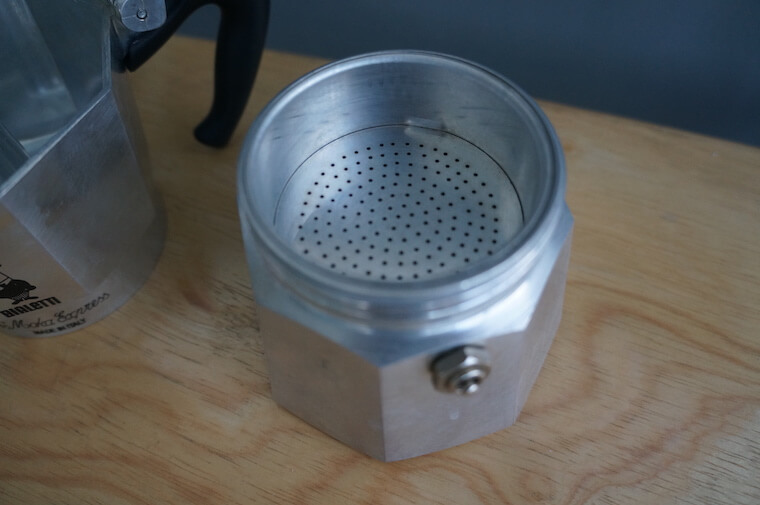 Its size and the lack of external paraphernalia (like filters) that you need make it a pretty useful travel coffee maker – providing you go somewhere with a stove. 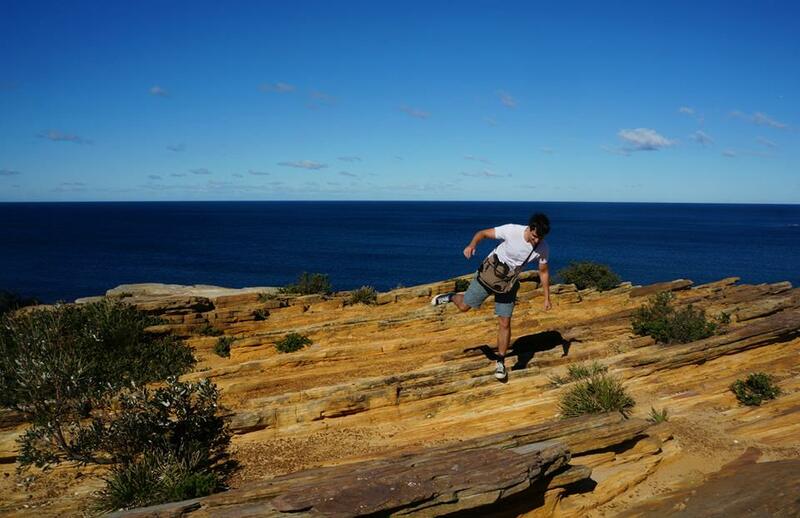 In fact, it’s very popular with campers for this very reason. After all, you still want nice coffee whether you’re stuck in the suburban sprawl or in the middle of the Appalachian mountains. What Are The Big Selling Points? 1. The original Moka Pot. 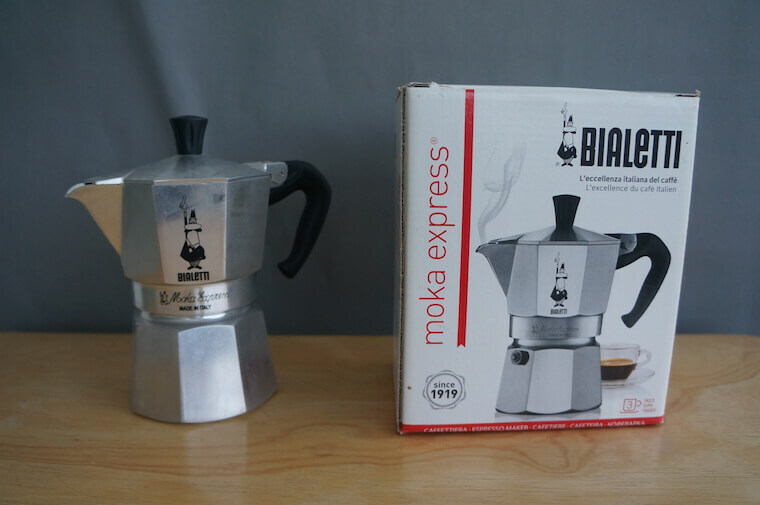 The Bialetti Moka Express is the original Moka Pot and so is why the design of most Moka Pots either imitate or flat out copy the Bialetti. Over 200 million have been sold in total and it’s still being sold in a very similar form to 80 years ago so you’re buying something that has firmly stood the test of time. The coffee you get out of a Moka Pot is really unique, kind of halway between the super strenght espresso and the weaker brewed coffee. As such, having one of these is great as a way to mix things up. I’ll discuss exactly how the coffee you get differs in just a second, but on a personal note, I love how the extra strenght of the Moka highlights the more flavorful notes in the coffee. In fact, I usually just drink it straight! 3. Can make espresso drinks. A viable espresso machine that can create something approximating the kind of coffee you might buy in a coffee shop will cost you $300 at a minimum not including extra paraphernalia. In addition, learning to make great espresso can take years (even if it is a fun exercise!) Buy a Bialetti and you bypass all that by creating your own ‘espresso’ with none of the cost or effort. This is pretty much the reason you see these little devices in most kitchens across the south of Europe! Bialetti often go above and beyond in the service department and a 2 year warranty on any coffee maker you buy is pretty fantastic. That’s a lot of time where you have no worries about any problems you may have with it. What Kind Of Coffee Do You Get With The Bialetti? The Moka Pot (invented by Bialetti) was originally designed as an alternative to espresso, which was and is super popular in Italy. As such, the product of your brew will be similar to espresso, a small amount of strong coffee. The 3-cup Bialetti I’m showing you in these photos makes about 4.4oz which is roughly the equivalent of two espresso shots. The Moka gives you a great tasting coffee, it gives a balanced brew which will highlight softer and more acidic notes while still giving good body. I’d actually recommend that you don’t add milk or cream if you are using high quality beans. For example, there was a bag I was drinking a while back from Costa Rica with notes of green apple and dark chocolate, those flavors really ‘popped’ when using my Bialetti, so much so that I just drank it straight! If you prefer though, the coffee you get from the Moka is small enough that you can create all your favorite espresso drinks with it. So add yourself some foamed milk and you’re perfectly capable of making yourself a functional Cappuccino, at a fraction of the cost and the education you need to make solid espresso. It’s important to point out that the Bialetti, with its aluminum body, is not dishwasher safe. It must be scrubbed out by hand. Thanks to its 3 part design though, this is no great task, there are no tiny crevices to wash out. Just dispose of the grounds and give it a rinse and you’re good. 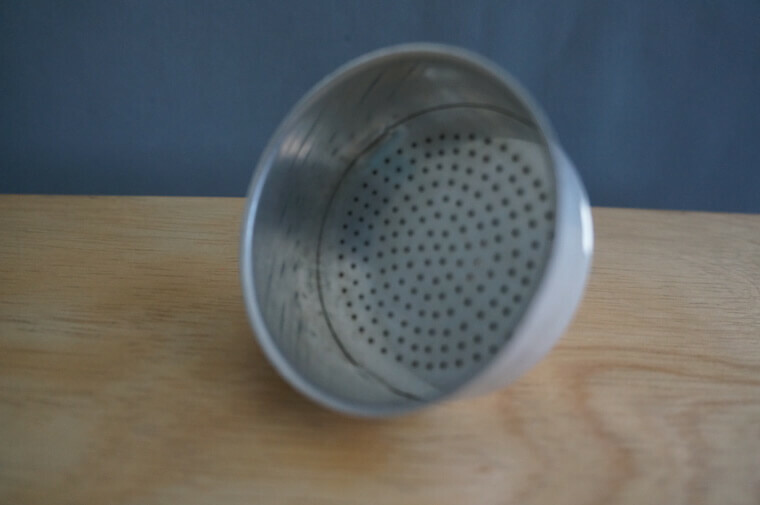 The other issue with washing is the possibility of the buildup of aluminum deposits, typically on the inside of the bottom chamber where you put the water. They will look like white stains on the surface of the metal and require a bit of vinegar/baking soda to get rid of them. While I’ve read about this stuff I’ve never experienced it myself. And that’s owning a Bialetti for years and using it fairly regularly, too. If you’re liking the sound of the Bialetti Moka Pot then you can check it out on Amazon here. The price hovers around $25-35 but you’ll need to click on the link to check out the current pricing info and reviews and whatever else you need. As it’s an all inclusive coffee maker, you don’t need to worry about buying paper filters or any extra stuff like that which is nice. Just get yourself some nice coffee beans and get enjoying your authentically Italian moka coffee! 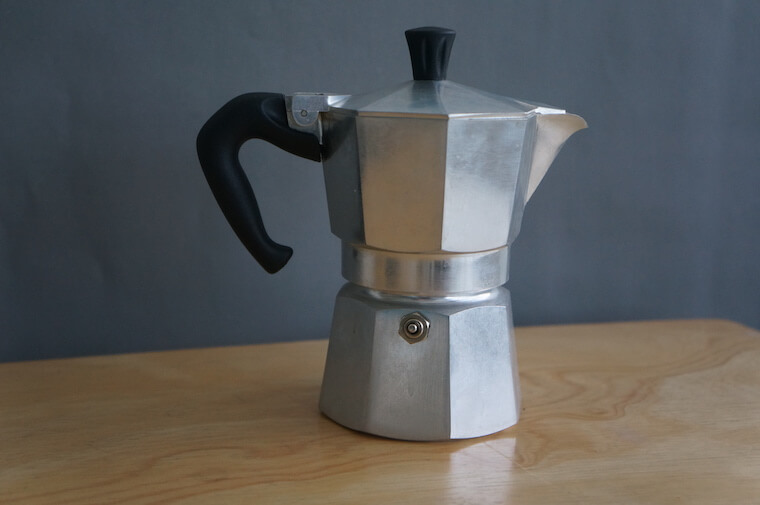 The Moka Pot is a pretty much ‘set and forget’ style coffee maker, in the sense that you don’t really have to do anything once you’ve set everything up. Just watch it make your coffee. It does mean that the one main variable that you are in control of, the grind size, is extremely important to making a good brew. 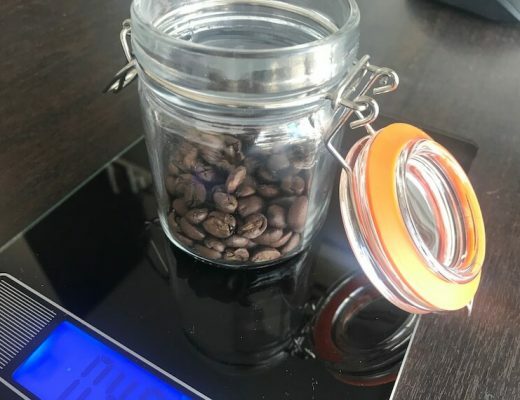 Too coarse and the water will pass through the coffee groudns too quickly and not extract enough, causing your coffee to be thin and too acidic. Too fine and your coffee will overextract and give you bitter flavors and also clog up in the grounds and take too long to brew. 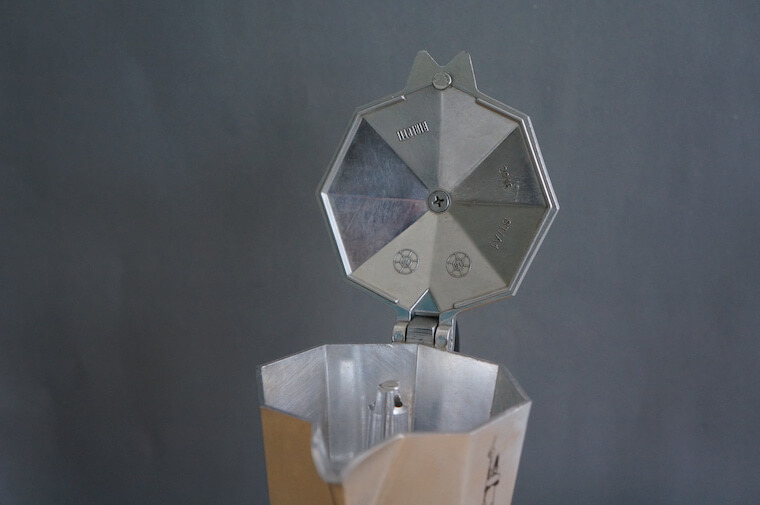 You can check how your grind size is by leaving the lid of the Bialetti up and watching it brew. If it spurts out of the Moka Pot onto your counter then your grind is too coarse. If it is a slow, slow trickle then your grind if too fine. You’re looking for a small spurt that doesn’t make it out of the Moka Pot itself. 2. Play around with the temperature. So if you’ve got your lid up then you can check to see if things are brewing well. One thing you can adjust is grind size, the other thing to adjust is your stove temperature. 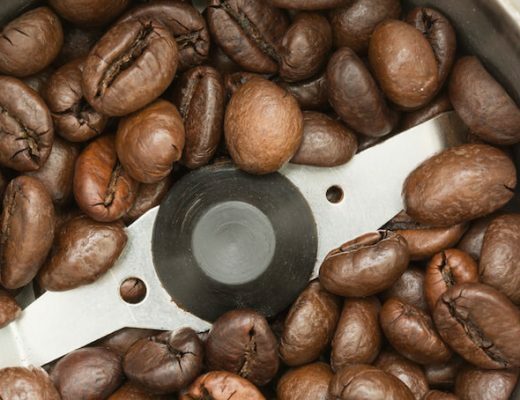 If your stove is too hot or your grind is too coarse, the coffee will spurt out of the fountain too easily, often spilling out of the Moka Pot and onto your stovetop. This implies that the coffee is not getting extracted enough which results in your coffee tasting thin, astringent and sour. If your stove is too cool or your grind is too fine, the coffee will come out of the fountain in a very slow trickle having been blocked up in the filter basket. This implies that your coffee is being overextracted which typically results in overly bitter flavors making it into your brew. You want the coffee to gargle it’s way out. More than a trickle, less than a spurt. Reading that back it’s not the ideal way to describe what you’re going for but hopefully you get the picture. I can try making a gif of an ideal flow rate if there’s any interest… Let me know in the comments. A lot of the skill in making great coffee is about balancing the variables, so don’t get discouraged if you don’t get it perfect right away. Play around with your stove heat and grind size until you’ve got it dialed in. 3. Boil the water first. An optional step, this one, but one I follow everytime I make a Moka brew is to boil the water before puting it in the bottom chamber. You can simply put room temperature water inside and let it boil in the Bialetti while it’s on the stove but I find this process painfully slow. It probably only adds 5 minutes to your brew but I’m a pretty impatient dude, particularly when it comes to coffee. 4. Use a direct flame. If possible, when you brew your coffee with one of these then use a direct flame. The heat transfer is that much faster. Using an elextric stovetop will still get the job done but you might get a little frustrated with brew times of up to 10-12 minutes. This can be reduced by pre-boiling the water, as mentinoed just above. How does it compare to other Moka Pots? 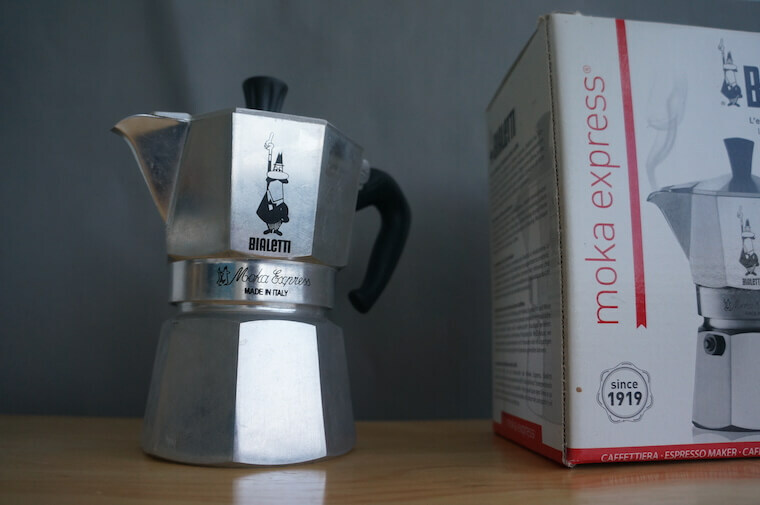 While the Bialetti Moka Express is the original Moka Pot that can be traced back several decades, there have been many new Moka Pots released. 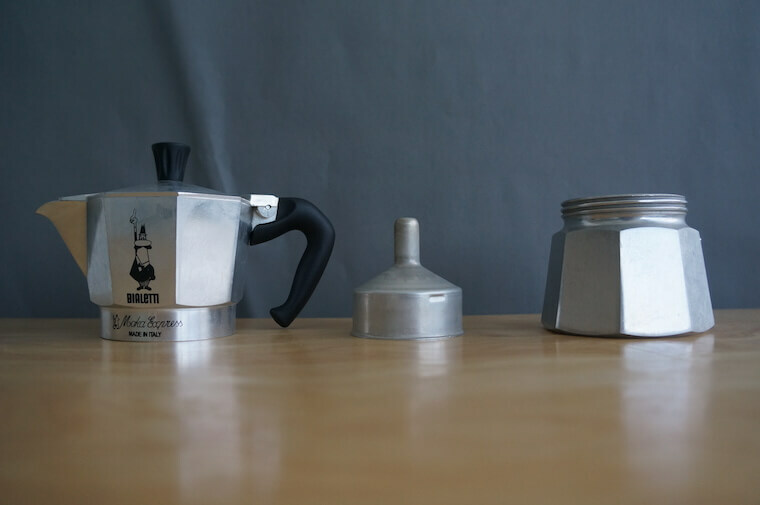 There are a number of different Moka Pots that are made of stainless steel rather than aluminum. These, as you might expect, typically cost more but come with the advantages of using a higher quality metal. There are also Moka Pots that have more of an emphasis on safety than the Bialetti, which perhaps would be more of interest to those who do not want burning hot aluminum coffee makers around with a few wild children in the vicinity! 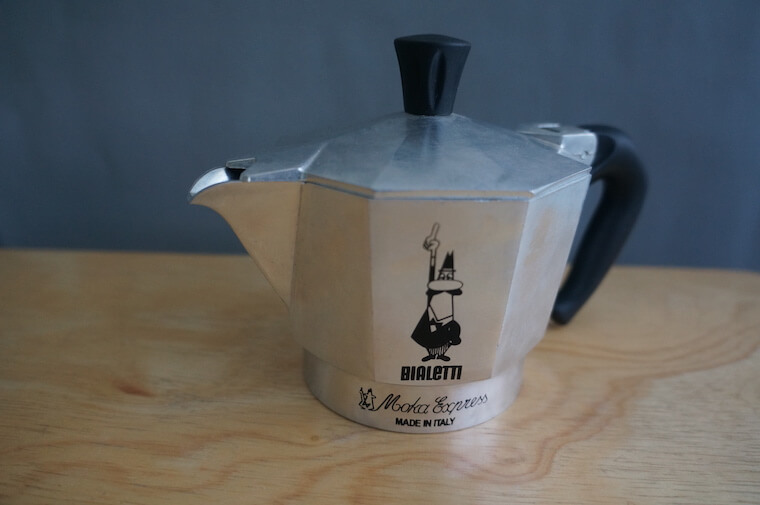 While I think the Bialetti is great and suits 90% of people’s needs, if you want to take a look at other Moka Pots you can check out my article here where I round up some of the best, including the Bialetti. You can also find many types on Amazon by doing a quick search if that’s no thorough enough! I have the Moka Express 6 cup which accommodates 9oz of water to the full line. My question is how much coffee grind should be used. The directions do not address this. Is it just a matter of preference or does the expresso like flavor have more to do with the amount used? Hi Julie, Moka Pots are not designed to have differing amounts of coffee and water. Sounds like you’ve got the water right, now fill the basket with ground coffee. This will ensure the Moka brews properly.